The fight between undefeated unified Middleweight world champion Gennady Golovkin and two-division world champion Saul “Canelo” Alvarez on September 16th had all the ingredients of a “Super Fight.” Two fighters with crowd pleasing style, who each have established themselves as being among the elite fighters in the sport. There was also the gradual build of anticipation as both fighters faced and defeated other opposition. Rather than discussing the various political elements and events that had taken place prior to the showdown between the two, an argument could be made that this was one “Super Fight” that did not take as much time to come to fruition as compared to other major events throughout the sport’s history. Although most folks that this observer had the pleasure of discussing the potential scenarios of this fight with in the weeks leading up to the bout had expressed to me that they felt this would be one that was too close to call and gave credible arguments as to how each fighter could win, the more I thought about the encounter in the weeks prior to the fight I began to have thoughts of the September 2004 Middleweight unification bout between world champions Bernard Hopkins and Oscar De La Hoya as something that could provide somewhat of a visual scenario as to what could happen when Golovkin faced Alvarez. 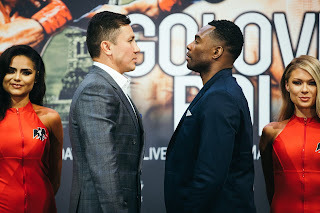 To be clear the bout between Hopkins and De La Hoya, which I covered when it took place, did not come to mind as something to serve as a direct comparison to Golovkin-Alvarez, but there were two similarities that did stand out. The main similarity was much like Oscar De La Hoya, Saul Alvarez had fought his career below the Middleweight division, despite briefly holding the WBC Middleweight world championship in his career. De La Hoya briefly held the WBO Middleweight world championship prior to facing Hopkins. In his Middleweight debut in June 2004 where he won the WBO crown, De La Hoya earned a controversial decision over Felix Sturm in a fight where De La Hoya started the bout strong, but gradually wore down perhaps due to fighting for the first time at a heavier weight than he had previously in his career. It was obvious despite his aggression early in that fight, that De La Hoya’s offense did not have as much of an impact as compared to when he fought opposition in lighter weight classes and it appeared that Sturm outworked him by the end of the fight. As was the case in his fight with Sturm, De La Hoya was able to hold his own against Hopkins, but was unable to land anything significant to discourage Hopkins from coming forward. As the fight progressed Hopkins gradually wore De La Hoya down and was able to score a knockout of De La Hoya in the ninth round with a left hook to the body. 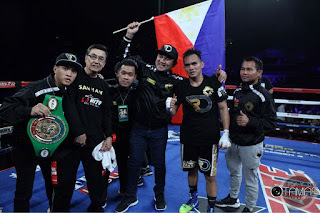 What made this fight come to mind specifically was in several of Alvarez’ recent fights he had opted to fight with a “Catchweight “ stipulation rather than competing in a weight class, despite winning and then successfully defending the WBC Middleweight crown in two fights fought under such stipulations. This observer has long been on record in expressing my strong dislike of the concept of “Catchweight” fights. Such a concept, which usually consists of a fighter facing an opponent who competes at a higher weight at an agreed upon in between point rather than the fighter who competes at a lighter weight having to face the fighter who competes at a heavier weight in that fighter’s weight class, creates an advantage for the fighter moving up from a lighter weight because it forces the fighter at the heavier weight to come down in weight where they are theoretically compromised and not at full strength. thus creating what often times can be a disservice to both fans and the sport in my eyes. Given that this fight was fought at the full Middleweight limit of 160lbs. it was logical to question both what affects would Alvarez’ punches have on Golovkin and how Alvarez would respond to a Middleweight’s punch. Although it was somewhat surprising to see a more tactical fight being fought by Gennady Golovkin early on given his reputation as a “Knockout artist”, I felt the fight was largely dictated by how well he was able to execute his jab and how he controlled the tempo of the combat. This was a fight that it became apparent early on that it would be a question of whether Golovkin’s greater activity would get the nod of the judges over Alvarez’ ability to execute his offense in spots. Even though Alvarez was able to have his moments throughout this fight, I felt that Golovkin was overall the effective aggressor and was the fighter who as the fight progressed brought the fight to Alvarez in being able to consistently push Alvarez back to the ropes and outworked him. Alvarez was also unable to land something significant to discourage Golovkin from coming forward in my eyes. It goes without saying that there can be a difference of opinion both before and after a major event such as this as to who may have gotten the upper hand. As is the case in fights that are considered close, there were some rounds in this fight that could be considered “Swing Rounds” where there can be moments that determine who got the upper hand in an otherwise close round. This was not a close fight in my eyes as I scored the bout 117-111 in points or nine rounds to three in favor of Golovkin. My scorecard was based on Golovkin’s greater activity and effective aggression. Alvarez simply did not throw or land enough punches particularly in some rounds that were close in order to sway my opinion. Although I stand by my scorecard, there could have been one or two rounds both in the first three rounds of the fight as well as down the stretch where depending on one’s perspective Alvarez could have gotten the upper hand, which could have resulted in scorecards of 116-112 (eight rounds to four) or 115-113 (seven rounds to five) in favor of Golovkin. I do not believe that this was a fight that could be separated by two rounds, but I can see how one could come to an eight rounds to four scorecard in favor of Golovkin. The end result of this fight a split decision draw has been met with much criticism in particular the scorecard of Official Judge Adalaide Byrd, who scored the fight 118-110 or ten rounds to two in favor of Alvarez. As is the case with most controversial decisions, there have been accusations of corruption and calls for investigations by Boxing fans. This observer has been known over the years as someone who has been critical of judges who produce scorecards that differ from a consensus opinion as to what happened in a fight. Although I obviously do not agree with Byrd’s scorecard as I feel it does not accurately illustrate what took place in this fight and did not give credit to Gennedy Golovkin for his performance, when something like this happens it is up to the respective state athletic commissions and respective sanctioning organizations to investigate. As I have often said over the years with regard to controversial decisions, even though the ultimate decision regarding investigations and/or potential action falls with the athletic commissions and sanctioning organizations, it is up to Boxing fans who tirelessly support the sport both by supporting the fighters themselves and with their money as well as those of us involved with the sport in various capacities to call for change.